To borrow a GOT meme, Winter Is Coming, and bugs are primed to foil all our best-laid plans. 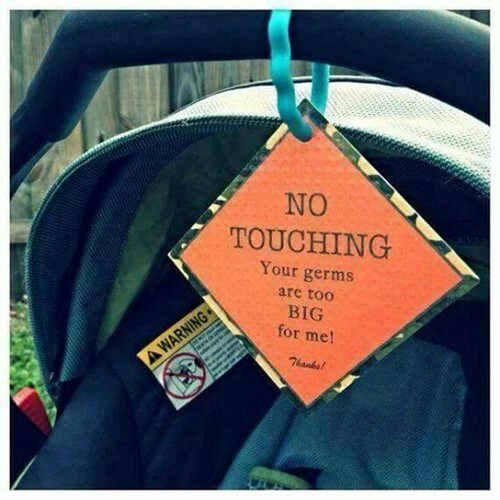 Newborns are especially vulnerable to seasonal viral critters—and some parents are taking serious measures to protect against pestilence: enter the “No Touching” sign. Reportedly, the No Touching newborn signs—to be tacked atop car seats and prams, or maybe crafted into a picket sign for your partner to wave as you approach publicdom—are trending on Etsy. For some, the signs are not direct enough. In support of the mums who use the signs, babies’ immune systems don’t mature until around 3 months of age, so extra measures are totally understandable. But health professionals emphasise that the maternal immune system protects the infant via antibodies shared through the placenta—for the first few weeks after birth. The point being, that, warding off germs is ultimately down to parental prerogative; good hygiene usually suffices, but a cute little sign probably doesn’t hurt, either. The Best (and Yummiest) Pregnancy SmoothiesCan Hynobirthing Help Labour?